Patrick of Pat's Fantasy Hotlist has posted his 2007 Year-End Awards. As with SFFWorld, Joe Abercrombie (The Blade Itself / Before They Are Hanged) and Ian McDonald (Brasyl) are in the list, as is Joel Shepherd (Killswitch ). Joe gets special mention as the "Most Improved Author Award" for the way he ramps things up in book two of his First Law trilogy. The guys at SFFWorld have put up their annual Review of the Year in two parts. They run through their opinions on the best fantasy books, best SF books, best films and tv shows, best comics and games. Very glad to see both Joe Abercrombie (The Blade Itself / Before They Are Hanged) and Ian McDonald (Brasyl) getting heavy mentions, as well as Kay Kenyon (Bright of the Sky) and my own Fast Forward 1 anthology. Thanks guys! Rob H. Bedford, over on SFFWorld, reviews Michael Moorcock's The Metatemporal Detective. Rob says, "While each entry is a story in its own right, they do fit together to give an overall tapestry of Moorcock’s multiverse. Stories range from turn-of-the 20th Century England to The Wild West of the 1800s to Nazi-era Germany. Though each of these time frames for the stories have an air of familiarity, each takes place on a world parallel to our own with slight differences. The Nazis in one world don’t quite escalate to power the way they did here, the United States of America isn’t so United in another. This is how Moorcock’s multiverse works, the worlds resemble our own but really aren’t. It is a neat trick and one of the strong points of much of Moorcock’s fiction – the intersection of history and fiction. Two elements, that when in the hands of a deft writer like Moorcock, makes for a very good story." I was particularly gratified to see that Rob's favorite story was "The Mystery of the Texas Twister," since I have a history with that story predating this collection. It might be my favorite as well, tied perhaps with the final entry in the book. Meanwhile, Rob concludes that, "The strengths of these stories are many. The twisting plots, the quippy dialogue between Begg and Taffy, the interactions between Begg and Zenith, and the cool settings to name just a few. The stories are entertaining and range across the spectrum of Moorcock’s wide canvas. This book will appeal to Moorcock’s many fans as well as fans of dashing, pulpy stories and will fit very comfortably alongside and within Moorcock’s Eternal Champion saga." Paragaea author Chris Roberson is the guest-blogger today on John Scalzi's Whatever. After saying a few nice things about Chris, John reprints his earlier essay "Mark Gruenwald, the father of modern superhero comics." Worth checking out. Joel Shepherd is the subject of two interviews. First, John Joseph Adams interviews Joel for Sci Fi Wire, about the recent release of Killswitch. Speaking of lead character Cassandra Kresnov, Joel told Sci Fi Wire, "She's not entirely sure of where she fits in anything and has no moral certainties save the value of human life and her own desire to do something useful. I think a lot of that comes straight from me." Then Jessica Strider interviews Joel for the World's Biggest Bookstore's Sci-Fi Fan Letter. Also speaking about Cassandra here (no surprise), Joel tells Jessica, "She's possibly the least biased and most open minded person you'd be likely to meet on most matters -- a natural pragmatist who is simultaneously intrigued by non-pragmatic things precisely because they're unnecessary. She looks at everything as though it were new and fascinating, which as a writer forces me to do so too." And remember, first chapters of Killswitch are available online. Moorcock: Always a Big Deal! Graeme's Fantasy Book Review proclaims that Michael Moorcock's The Metatemporal Detective "manages to capture perfectly the ‘pulp feel’ of the authors that Moorcock has affection for. Hard-bitten detectives, beautiful women, gun fights and car chases sit within these pages and some of the double crossing kept me guessing right up until the end of each story... All in all, a very entertaining read that made my daily commute go very quickly. A good one for fans, who are looking for their favourites, as well as the casual reader who may be looking to try Moorcock for the first time." David Louis Edelman is the guest-blogger today on John Scalzi's Whatever, for day fifteen of his "Month of Writers." Scalzi is inviting authors who blog to post their favorite entry from 2007, and Edelman's is his piece on what the Bourne Identity films tell us about America and American politics (which originally appeared on Dave's blog here.) This happens to be my favorite post from Edelman to date as well, not the least for its contrasting of James Bond and Jason Bourne. Meanwhile, Dave has let me know that he is going to be part of the Library of Congress' "What If... Science Fiction and Fantasy Forums" series, appearing on February 21, 2008. With Starship: Mercenary just released, Paul Raven has a very thoughtful review of Mike Resnick's previous book in the series, Starship: Pirate, up on SF Site, which he recommends as "a story that moves very fast and covers a lot of ground within a very small page count." Paul discusses the way that Resnick's work is "a deliberate attempt...to subvert a genre that, while viscerally thrilling, rarely addresses the deeper implications and ethics of conflict in a universe that isn't painted black and white. There is much to be lauded in this approach -- a more mature and thoughtful way of presenting the classic hero figure." He notes that while Resnick's hero, Wilson Cole, manages to avoid going in "guns blazing" by applying intelligence beforehand, that "That's not to say nothing happens, though. Far from it; almost all the narrative is subsumed by dialogue –- dry, witty dialogue at that –- and the prose has the feel of being almost cinematic, or perhaps televisual, in that there is almost zero reliance on a third-person narrative point of view, and the characters banter and back-chat with the easy familiarity of sit-com scenes." He concludes by proclaiming that Starship: Pirate is "a surprisingly thoughtful novel dressed in the clothing of classic SF adventure," and wondering if it's uniqueness will be a handicap in finding an audience. Fortunately, we already know beyond a shadow of a doubt that that isn't the case! Mike Resnick's Starship: Mercenary is starting to appear on shelves both real and virtual. I see that Powell's and Barnes & Noble lists it as in stock, and suspect Amazon will soon follow. Books left our warehouse in two shipments, this week and last, so it should be hitting stores soon(ish) too and may already be in a few. Like the two previous Starship books, Mercenary features the usual appendices. This time Deborah Oakes supplies floor plans of "Duke's Place," a spacestation casino that factors heavily in the story's events. Meanwhile, we've posted sample chapters of what is my favorite Starship book to date online for you to peruse, along with a swanky banner courtesy of Prometheus' Amy Greenan. (Feel free to swipe it and post it everywhere.) And in tomorrow's Pyr Newsletter illustrator John Picacio has some exclusive words for our readers on how he created the cover for one of the best looking books we've done to date. Great times in Austin, Texas yesterday...Mike Moorcock and I signed copies of The Metatemporal Detective at BookPeople, the largest independent bookstore in Texas. 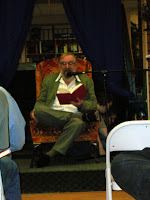 Mike did a short reading from the book, and then answered a wide range of questions from the audience. Amongst the topics discussed -- the origins of Elric; his theories on magic; the status of the developing Elric film project; his relationship with the Weitz brothers; his days with Hawkwind; why people should read Barry Bayle y; and much, much more. After that, we signed lots of copies of The Metatemporal Detective and hey, even some copies of my artbook, Cover Story: The Art of John Picacio. Mike's birthday isn't until Dec. 18th, but that didn't stop us from celebrating with a decadent Chocolate Eruption cake, sponsored by The Metatemporal Detective's ever-loving publisher, Pyr. Damn good. Here's what it basically looked like, but much bigger (scroll down the link above for "Chocolate Eruption"). After such a fine dessert, Linda Moorcock suggested we have dinner at Hyde Park Grill....fried egg sandwiches; buttermilk-battered fries; Kobe beef burgers; chicken fried steak; corn & cheese tamales; sirloin burgers smothered in cheddar cheese and scallions....so good. If you attended the signing, thanks for coming out, and if you missed out, maybe we'll try to do it again in '08 when Elric The Stealer of Souls releases in February. Lisa Tuttle, of The Time's Online, has recommended Ian McDonald's Brasyl as part of The Times Christmas choice: science fiction / fantasy. She says, "Brasyl is the best novel yet by Ian McDonald, who deserves to be much better known. Audacious in scope and style, the story he tells is very human, full of vividly realised characters. It is a magical alternative history of Brazil and a mind-expanding intellectual adventure in prose bordering on the hallucinogenic." Meanwhile, Jeff Vandermeer, of Amazon's Omnivoracious blog, recommends Michael Moorcock's The Metatemporal Detective as part of Four Great SF / F Gifts. He says, "Put out in a gorgeous hardcover edition from Pyr, featuring the art of World Fantasy Award winner John Picacio, this collection of short fictions will entertain anyone who loves wild imagination wedded to impeccable storytelling, along with liberal doses of humor and suspense. Detailing the exploits of Seaton Begg and his companion Dr. "Taffy Sinclair" as they solve mysteries in alternate universes, The Metatemporal Detective ranges far and wide, from 1960s Chicago to the wild west to Paris and points unknown. Another example of the range and depth of Moorcock's prodigious talent." Mel's Take, a review segment on the podcast Escape from Cubicle 17, launched with a review of Alexis Glynn Latner's Hurricane Moon. Joseph Mallozzi, executive producer of Stargate SG-1 and Stargate: Atlantis, is a big SF&F reader - and you know it's always interesting to me to discover people from the filmic side of the genre who are. He's such a heavy reader, in fact, that each month Joe picks two science fiction titles and two fantasy titles and asks his readership votes for one of each to read and discuss. "Free copies of The Blood Debt to three lucky readers who finish The Crooked Letter and are ready to continue the series. Winners will be announced sometime in mid-January so start reading."